Ricardo Caballero vive e lavora a Città del Messico; di formazione psicologo, inizia a occuparsi di arti visive, multimedia e composizione musicale, fondando i gruppi di ricerca Domestica, PORO, e creando il Reallovedestroys project. Vero e proprio pioniere del noise messicano, pubblica per le etichette Poro Sound e Deadline Recordings ed è ospite recentemente come performer del Festival X-Lisbona, del BAC 06! CCCB-Barcelona, e di Rencontres Paris-Berlin. Si occupa inoltre di insegnamento delle arti visive in centri di riabilitazione psicosociale. Il live presentato a Netmage 08 è stato sviluppato come un ibrido analogico-digitale, VHS-preparato e lap-top, volendo enfatizzare un contrasto netto tra le evoluzioni reciproche della traccia visiva rispetto a quella sonora. Ricardo Caballero lives and works in Mexico City. He studied Psychology for two years at the Universidad Nacional Autónoma de México before graduating with a Degree in Plastic Arts from la Escuela Nacional de Pintura. For four years he has attended the support workshop at the Center Multimedia of the CENART, as well as attending composition courses for electroacustic music and programing of Max/Msp. 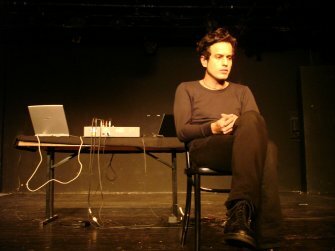 He has collaborated in the foundation of experimental Art Groups such as Domestica and PORO, and is a pioneer of noise in Mexico with the creation of the Reallovedestroys project. He was awarded scholarships by the Fonca in 2002 and the Mexico City Institute of Culture in 2001. For four years he has taught in Art workshops of drawing and painting in Mexico City jails including Centro Varonil de Rehabilitación Psicosocial as well as in Centro Femenil de Readaptación Social, both of which were created for populations ineligible for parole. His work as a Noisician has been included in many compilations expecially for the Poro Sound Label and Deadline Recordings. His Noise Improvisations have appeared live in numerous venues of Mexico City, and festivals around the world. His Experimental Videos have been included in festivals including Festival X (Lisboa, Portugal), BAC 06! CCCB (Barcelona, Spain), and Recontres Paris-Berlin (Paris, France). For Ricardo Caballero, the only border that remains in the distance is Silence. For this project, visuals are prepared and planned to be played in an analog way with a common VCR player, while sound is controlled and created digitally. It is important to create contrasts between the evolution of sound and video projection. The VCR will be previously prepared manipulating basic circuits inside it that will effect the reproduction of video, creating analog effects on visuals.